SINGAPORE - Singapore's first integrated community hub, Our Tampines Hub, will open in stages from November this year. 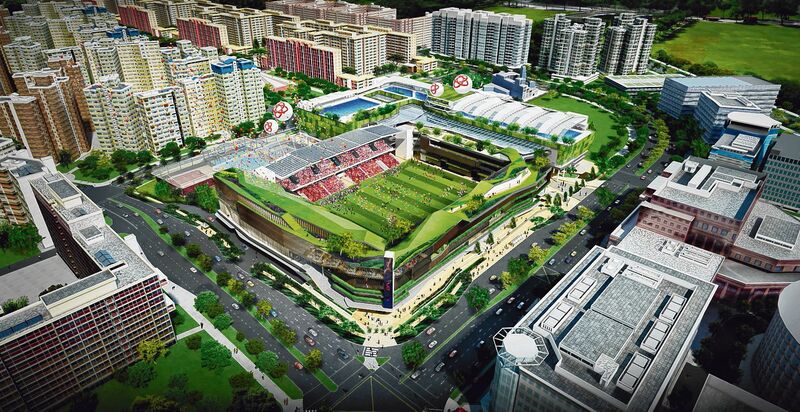 The 5.3-hectare project, which is the size of about seven football fields, sits on the site of the former Tampines Stadium and Sports Hall. An 800-seat hawker centre, 20 badminton courts, a one-stop centre to access government agency services, a community kitchen for seniors, and more than 100 retail shops are some of the facilities residents can enjoy when the new town hub at Tampines opens. From January next year (2017), the gym, karaoke and bowling facilities will be ready. And by August 2017, amenities such as the swimming complex, performance arts theatre and library will be open to the public. Some 3,000 Tampines residents came together on Sunday (Feb 21) for the topping-up ceremony of the new hub, which was first introduced in 2011 by then-National Development Minister Mah Bow Tan as part of the town's five-year masterplan. After starting the day with a mass walk from the five community clubs in Tampines, residents had a preview of the range of the hub's facilities at the project site for the first time. They were joined by advisers to Tampines GRC Grassroots Organisations, Finance Minister Heng Swee Keat and Mr Masagos Zulkifli, Minister for the Environment and Water Resources. Other MPs of Tampines GRC who were also present at the event were Mr Baey Yam Keng, Parliamentary Secretary for the Ministry of Culture, Community and Youth, Mr Desmond Choo and Ms Cheng Li Hui.